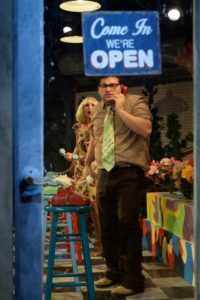 Little Shop of Horrors at Playhouse on Park – only 5 shows left! Come visit! One of my favorite things to do in life is get a bunch of talented and nutty people in a room and make some meaningful and (hopefully) hilarious theatre. Returning to Playhouse on Park every year – this time to work on Little Shop of Horrors – has given me the opportunity to do just that. We started off messy…I encouraged the actors to throw any and all ideas into the ring – playing off each other – collectively working to bring Howard Ashman’s smart script and Alan Menken’s delicious score to life. The acting ensemble bonded in just a few short days, and it very quickly became hard to tell whose good idea was whose. The process took on a life of its own (oddly much like Audrey II) – and you could almost literally see a flow of great and colorful (green??) energy emanating from the group. Such a joy to witness!